minerals and gemstones for the benefit of yourself, others and the environment. You will learn practical skills, techniques and underlying principles, which will allow you to continue your own journey of exploration and learning long after this weekend is over. Training is practical, experiential and does not require acceptance of any particular belief system. While we may discuss ideas, theories and background to crystal healing and energy work, the emphasis is on practical, provable methods and techniques. This weekend forms the necessary foundation to continue to training if you wish. • Ways of choosing which quartz crystals, rough and tumbled minerals and gemstones to buy for personal use, to give to others, or to use for different purposes. • Caring for your crystals - cleansing, dedicating and energising them. • Exploring different ways of working with crystals: self-healing, meditation, journeying, massage, enhancing the energy of homes, offices and outside spaces etc. • Programming crystals to work in different ways for you. • Developing awareness and sensitivity to crystalline and mineral energies and noticing changes in your own and others’ energy systems while working with gems and minerals. • Developing sensitivity and intuition with regard to the energies and properties of minerals, through meditation, visualisation and practical sensory-based exercises. 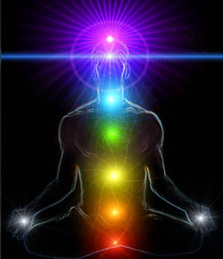 • Introduction to the chakra energy system. • Introducing the effects of colour in crystal healing and personal development work. • Experiencing properties of a basic healing range of minerals and gemstones. • Dowsing chakras to detect imbalances using a crystal pendulum. • Balancing chakras to correct imbalances using a crystal pendulum. • Giving and receiving a basic chakra gem stone layout. This course involves both practical work and theoretical knowledge and uses accelerated learning techniques in relaxed states to assist your assimilation of the material. Methods include lecture, discussion, meditation, visualisation and practical experiential work. A willingness to relax, enjoy yourself and experiment, with an open mind. Wear comfortable clothes and bring pen and paper for your personal notes. (You will also receive course notes on the subjects covered). John Spillman first learned hands-on energy healing in 2005; s began her training in Crystal Healing in in 2005, and then took a 2-year Diploma in Crystal & Gem Therapy, qualifying in JUNE 2007. John has taught Crystal & Gem therapy practitioner training since 2008, and is also a qualified Reiki Master Teacher healer. With 2 years on committee of UK Reiki Federation.